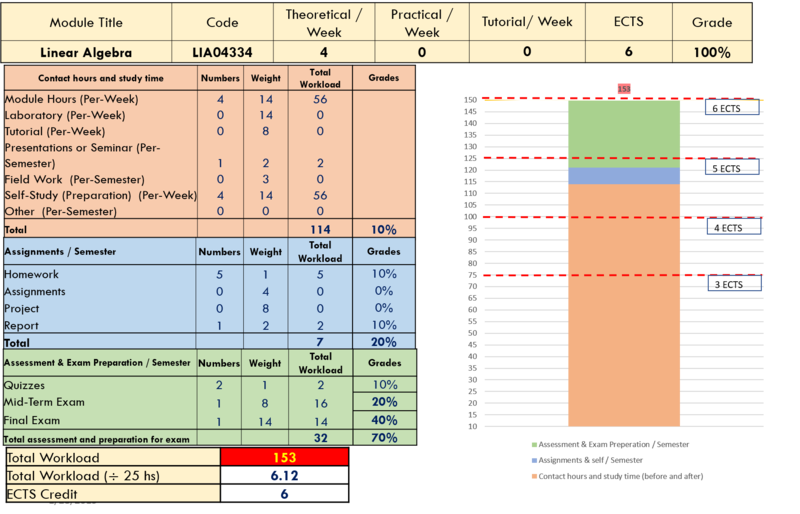 At University of Zakho the ECTS for any module can be calculated based on hours that can be performed by students as a Student WorkLoad (SWL). This is categorized by three main categories: Contact hours and study time(1), Assignments (2), and Assessment & Exam Preparation(3) (Figure 2). Each section has it is own required time that is going to be multiplied by a weight in order to calculate the total hours that students need to spend within this category. An Example is shown in Figure 3. Therefore, the total calulated hours in all categories will be summed-up and then divided by 25 (as each ECTS corresponds to 25 hours). Doing this, the ECTS of a module will be known. Below is an example of calculating ECTS for a Linear Algebra module (Figure 5).